Life game puts a grid of cells, each of which is either alive or dead. When it transitions to the next generation, the cells either die or breed according to the density around the cell. 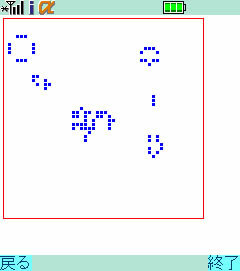 When an instance of the Frame class is passed to the Display.setCurrent method, the screen switches to that instance. * Transition will always use this method. The arrangement of Life Game's board is saved in a matrix variable. The method "next" transitions to the following board, and "paint" draws the board. The Constructor configures the initial status. * live cells around it, it lives. * are 3 live cells around it. * Otherwise, it remains dead. Buttons to start the game, edit the cells, save, load and change the board size are created below. * assinged to each button are executed. It holds instances of LifeGameApplication and LifeGame. The method LifeGameCanvas.next is invoked once every second and draws the screen updates that transition to the next board. This method next is called by an instance of LifeGameMainCanvas once every second. This canvas class contains variables for cursors and manages processes such as cursor movement. LifeGamePanel saves instances of LifeGameApplication and LifeGame, and manages the drawing of soft keys. MemoryPanel manages the scratch pad, and is inherited by SavePanel and LoadPanel. ChangeSizePanel changes the size of the board. This class uses the scratch pad to load / save the board. There are two methods to draw the screen in mobile Java. The component method is well-suited for simple windows like menus, but its timing differs in each profile. The coordinates technique uses the abstract method paint() from the Canvas class. Implementing paint in a sub class that inherits from Canvas, automatically redraws the screen. //Lock screen, do double buffering. Event handling in DoJa is managed by the event handling methods in instances of the screen. The Connector class is used to open streams for reading / writing to the scratch pad. Scratch pad data is saved even after application termination. //when failed to read data.